It’s back!! 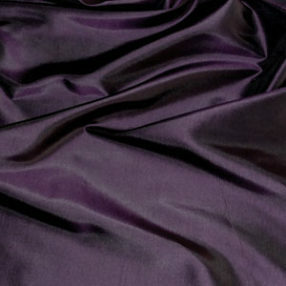 This lovely deep shade of Eggplant in 100% silk taffeta. Great for many projects and time periods. Ask for a swatch. Lovely to work with, stunning color. This is a shot silk taffeta, with a black warp and a magenta weft, which yields a magnificent mulberry color. I made an evening gown plus a bow tie and cummerbund for my husband, and got many compliments.